Home » Lifestyle » Why is there sugar in my baby formula? Why is there sugar in my baby formula? The first thing I am going to say, because we are online and it can so quickly go uncivilized, that this is not a breastfeeding vs formula debate. But I do want to discuss something. Why the HELL does my sons formula have SUGAR and Corn Syrup in it? Here, let me get closer. I am going to not sit over here and pretend I am a world class healthy eater. Sure, I am great with portion control and am not overweight (save for the 5 pounds I still need to lose from pregnancy) but I do my fair share of going out to eat and drinking cokes. You already know that if you read my blog. My son is a newborn. Why would a baby formula ever need added sugar? Giving it the benefit of the doubt that it was some sort of “requirement” in the processing (hey, I’m stretching here), I checked other sample formulas in my home and couldn’t find these two ingredients listed in the few I checked. Keep in mind that this is my “Dr. approved” formula. I am not trying to put little P on a diet or anything, but can anyone answer WHY my 5.5 week old is getting supplemental sugar mixed in with his nutrients? Corn syrup is by far WORSE than sugar. The medical community uses sugar as a method to ease an infants pain. Sugar is nothing like corn syrup which is made of GMO corn & causes obesity. So far the only formula my 5 month old can eat with no problems is the Similac Sensitive. I had to stop breast feedding after about two months because my supply ran out because I went back to work a week and a half after I gave birth. I have tried Enfamil Gentlelease, AR, and Reguline, Gerber Soy, and Similac Alimentum. All those formula cause him to spit up hours after feeding. I have even had him on two different reflux medicines and tried tucking his formula with baby oatmeal. Nothing is working so we are back to trying the Similac Sensitive after a month of issues. If anyone as any better suggestions, I’m open to hear your thoughts. Try Enfamil Gentlease, they don’t use SUCROSE in any of their products. I used it with my son. He is happy and healthy, and SUPER smart! Felt compelled to point out, since debbie caught some flack, that her comment against commercial formulas did not in any apparent way to me appear to disparage mothers who don’t breastfeed. She simply pointed out the inadequacies of COMMERCIAL formula, not formula in general. I’m sure there are some lovely, incredibly healthy brands out there, and there are also some wonderful recipes moms can make at home. Homemade anything, using whole fresh ingredients, is usually superior to store bought, and certainly there are better formulas out there than one that used isolate vitamins and is inorganic. disappeared. I would never give a baby sucrose. I can’t imangine why Similac things it’s okay. Enfamil is the #1 brand recommended by pediatricians. Every baby is different, but for my son he does the best with Similac Sensitive. I tried a sugar free formula & he got very constipated. What did the doctor recommend to me??? Karo Syrup! I am going back to similac sensitive. These commercial formulas are pure garbage. I wouldn’t feed it to my dog, let alone my baby. Wake up people. you are so ignorant to the fact that some women simply cant breastfeed. my reason being medical. it’s posts like yours that make moms who are doing the best they can feel guilty. it’s mean. i’d rather be a formula fed baby with a nice mom rather than a breastfed baby with you as a mom. I just found this out last night and I am sick to my stomach that I’ve unknowingly been giving my 8 month this! I would never take a spoon full of corn syrup and sugar and put it in his mouth although thats exactly what I’ve been doing!!!!! 🙁 Ugh! Time to talk to his doctor and get him on a natural protein shake instead of formula! How scary is this that our kids are being set up for disaster from day 1 and we wonder why our children are becoming obese! Well duh we’ve been feeding them this since day 1 so that’s all there bodies know and continue to crave! I’m going to do everything I can to make sure that my baby is healthy and read every label before putting it in his mouth! WHAT A WAKE UP CALL!!!! I enjoyed reading your post because it was full of passion and determination. You’re so right. This IS a major wake-up call. Sugar, specifically high fructose corn syrup, is the major cause of many illnesses including hypoglycemia and diabetes. MANY people don’t even realize they’re walking around with hypoglycemia or are having symptoms and illnesses due to sugar. Exhaustion is one of the most common symptoms. Take a look at http://www,gethypohelp.blogspot.com to learn more about this. YOU WILL be shocked by what you learn. And please educate others. 1 tbsp. This is the most important part of the formula because it delivers much needed protein, fat, and carbohydrates in a form that is easily digestible and absorbable. If you can get your hands on safe, raw goat milk, do it, otherwise I recommend using CapraMilk. Note: CapraMilk is back in stock! We have a limited supply so get it while it lasts! 1 tsp. This is one of nature’s greatest fat sources. Don’t let our high strung public health officials scare you into thinking saturated fat is all bad. Without saturated fat, we would all be dead. The saturated fat in coconut oil is high in medium chain triglycerides, and contains such important compounds as lauric acid which is found in high amount in breast milk. 1 tsp. Olive oil delivers more healthy fats, this time in the form of monounsaturated fats. Make sure you buy a high quality brand as many olive oils have been adulterated with lesser quality oils. The Kirkland Signature variety from Costco has been a good source for us but you may find others that work well too. 1 tbsp. There is a bit more room for flexibility in this arena because there are a lot of high quality carbohydrates that can be used. I recommend organic raw, turbinado sugar, lactose, organic maple syrup, or brown rice syrup. This is an important component because the main nutrient in breast milk is carbohydrates. I use the turbinado sugar that I found at Safeway. ⅛ tsp. This thick black syrup is high in vitamins and minerals and keeps baby from getting constipated so be careful not to give too much! Make sure you get the unsulphured variety as it is far better for your little one I bought my bottle at Safeway. ⅛ tsp. Probiotics are a naturally high in breast milk and there are several different strains that are perfectly designed for infants. Bifidobacterium infantis, Bifidobacterium breve, Bifidobacterium longum, and Saccaromyces boulardii all have clinical research that shows safety in infants as well as many beneficial effects. I recommend the Garden of Life brand but there are many high quality infant probiotics available. Since most probably will only recommend them for kids 3 and up, I suggest only using half a dose. 1 tsp. I use a natural source of vitamins called fruits of life. This is concentrated fruit which carries with it many bio-organic vitamins which are readily accepted by the body. There are other individual products you can add like brewers yeast, acerola cherry, etc. that each deliver specific nutrients but I have been satisfied with Fruits of Life. Ironically, within weeks of me publishing this story, Garden of Life discontinued their line of Fruits of Life. Alas it was for the better because I came across an all natural multivitamin drop that is readily absorbable called Country Life: Maxi Baby Care. My son is 15 months old and he ended up doing the best on Similac Sensitive. He still doesn’t tolerate regular milk well and drinks toddler formula. I have found that it takes weeks to get adjusted once you find the right formula. I know its expensive, but try the formula in a can, the ones you put in the fridge. It may be that the mixture that he is getting isnt blended well enough. Its so hard to get it just right. When I went through all that w/ my son when he was young, I noticed buying the premix or the concentrate worked the best. I do know its expensive though. Hello, I have a 9 month old baby, I have done a lot of research do to the recent situation with Similac and GMO’s, they use corn syrup and now it has been linked with high amounts of mercury, So this milk is really bad for babies as well as Enfamil. GMO (genetically modified organisms) corn has been completely been modified to create it’s own pesticide by adding a bacteria to it/ it has not been proven safe for human consumption and they are feeding it to our babies. I used Similac a few times but my baby would have colic. I tasted it and it tastes like nothing but chemicals. Remember this ingredients have pesticides and a lot of bad chemicals that are fed to the cows. I found Holle baby formula, it has been great, it is organic and non GMO. my son has no colic and it rinses right of the bottle like breastmilk which I still feed my son, Please research the ingredients before you poison your baby. Mercury is linked to Autism and now 1 in every 88 children has autism, and soy in the U. S is GMO too, plus it should not be fed to baby boys because it affects their hormones. And you Keri must be a stoog for Big Pharma. What do you get paid by, the hour? Or the post? 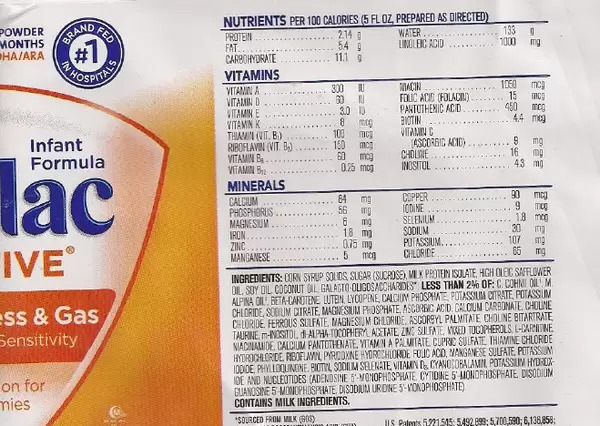 If you look at Similac advance it does not have corn syrup listed as an ingredient. It has been added to the “sensitive” formulas To help promote carbohydrate absorption. Most formulas have a single carbohydrate that is absorbed in the body through one mechanism of action. The problem with that is that all the carbs aren’t absorbed so they sit in the gut of the baby and ferment which cause gas. Similac has added a second carbohydrate to their formula so the carbs are absorbed through 2 non-competing pathways. Think about it as an interstate highway. If you have a single lane traffic gets backed up but if you have two lanes, traffic flows better. Even though sucrose is listed as the first ingredient it does not exceed the amount of sucrose that’s found in a standard apple or an orange. If you are concerned with the amount of sucrose stick with Similac advance. I hope that helps! I observed the same in the formula my son was given at the hospital. He had a really tough time keeping it down. My sister recommended Gerber Goodstart…best thing I ever did for my lil dude. I noticed one of the 1st ingredients in Goodstart was the whey protien, heck that’s what his dad (Me) drinks in his protien shakes for growth…must be good for him too. My lil dude never had another problem! my daughter (2 months) is also on Goodstart with no propbs…she does spit up a lil, but that mainly due to her chunky self wanting to eat more than release her built up gas. lol. dk if this helpos, but it’s my 2 cents as a Dad. It was interesting reading all the responses, as I had no idea why it might be in there! oh btw, i just found your blog a couple months ago & i am absolutely hooked. i love your nursery for your little man. & if you would like to see what i did for my little girls nursery i would love to send you some pics. Newmama…all products of Enfamil most certainly have sugar. It’s in the form of corn syrup (as the top ingredient), and sucrose. Sucrose = table sugar. Also: they are not listing the sugar content in grams on the ingredients label for a reason. These companies are there to make a profit. They don’t care that this is a brand new life starting out. Sucrose is sugar, as the prev poster said. We had X on the same formula you’re using (Similac Sensitive) when he was baby. We asked the Pedi the same question. He explained that it was to help with digestion. He highly recommended it, so we used it. X is now 5, we saw no negative repercussions from it and plan to use it with my new granddaughter. People buy the soy milk for more reasons than just lactose-intolerance. There is a large and growing body of people who are Vegans and do not want their children drinking cow’s milk (stolen from another species, while the baby calf whom the milk was intended for, gets disposed of in one way or another) for moral, health and environmental reasons. Cow’s milk contains more than 80+ hormones per glass of milk, blood and pus. It causes acne, along with sugar, and many other health problems. I breastfed both of my kids and chose not to give them cows milk formula. That being said, this mom is asking about cows milk and soy formula. Infant formula isn’t “live” like regular cows milk because it has been broken down and “cooked” out. They kill any good bacteria that would normally be in cows milk or any other animals milk for that matter. And even if you are vegan you need to understand that a baby NEEDS lactose for proper brain development and it is found in human breast milk for that reason. So it is a choice whether you choose to nurse your baby or not. You sound like a a moron and lunatic. Humans are omnivores by nature. I can’t wait to see how tiny, malnourished, and as a result, stupid your child turns out. It should be considered child abuse to push your irresponsible beliefs on a child who needs proper nutrition. It’s very rare for a baby to have a true lactose intolerance, Mothers produce it in breast milk and it is a sugar/carbohydrate that gives baby energy. It is also found in Cow milk. It is VERY important for brain development. Feeding your baby a formula with fructose instead of lactose isn’t a good choice nutritionally. I would encourage you to do some research on it. More often, a baby can have trouble breaking down cow milk proteins. High fructose corn syrup is considered an artificial and much more cost effective alternative to regular sugar in most cases. Ultimately, he needs the sugar but, in the lactose form! Find a good formula that contains lactose instead of fructose. We used to put a tiny amount of corn syrup in Kambry’s. Bottles because the extra iron in hers made her gassy. Sounds weird but it worked. Wow – I had NO idea! I wondered this too when I worked in an infant room at my mother in law’s daycare center. My mother in law had told me that sugar is to help aid the digestion and to also level out blood sugar. As humans, we all need sugar. We just don’t need a whole lot of it. It helps our brain function better. I’m just going off what she said- she has 30 years knowledge in child development. This is the same formula we use. N has a sensitive tummy (is lactose intolerant) as was H and myself. Moms of lactose intolerant babies are pretty much screwed cause there’s this brand which is mostly corn syrup or there’s Alsoy which is soy based and as I understand it, soy isn’t very good to consume either – it farks up hormone balances. I don’t see why we can’t readily get goats milk formula because that would solve everything. I breastfed till 9 months and he’s turning 1 this month so we’ll be switching to Lactaid milk soon and I’m glad he won’t be on the chemical concoction any longer! Abby was on a formula we called “liquid gold” it was so expensive. It is hypoallergenic and supposed to help with a number of feeding issues. She was allergic to my breast milk yet she was fine on this formula. Corn syrup solids is #1. If any formula was going to remove something not needed, I’d think it would be this one at $35 for a small can. But there it is. I pay $27 for mine, i feel your pain. Wow…I can see why it might be necessary after reading the other ladie’s responses, but holy crap, that is something I would never expect to see on a baby formula! Hmmmm..definitely interesting. But, I wonder what else they could use (if I understood your response above that he’s not on soy or cows milk)? I would definitely ask the formula company. Having said that, I wonder what the second ingredient is in breast milk..I think the first is water, but what comes next? the sensitive takes the lactose out of it…..I think thats the part that causes some fussiness in young babies. It has a milk protien, but I think its all a softer formula if that makes sense. Cat listed an article below that solves it..its not good news. thanks for finding that cat. Unless there’s a more scientific reason that I haven’t found yet, I agree, that does seem silly. I could understand a wee bit if they did that so breastfeeding moms could supplement without issues but that’s clearly not the case because formula tastes horrible regardless of the sugar they put in it. And it might just explain why my formula fed babies were nearly twice as big as my breastfed baby. She was tiny, even scrawny but very healthy. yeah, he doesnt get constipated that often..its just more a gas and spit up issue (Or it was early on)….now his system might be doing better but i didnt want to change formulas midstream. In fact, most of his diapers are runnier than I would like..this might be why. I honestly don’t know why they would include sugar unless its part of their base formula or the sugar plays a key ingredient in reducing gas. Why don’t you ask the doctor or even contact Similar to see what they say about it? If you want to compare apples to apples compare similar advance to your newborn. You will find no added sucrose in similar advance. For an explanation of why it has been added in the sensitive line please see my post below. Hope that helps! You need to be directing your very valid question to the makers of the fomula. They’re the ones who should be able to present (non-existent) facts as to why the 1st 2 ingredients (and ingredients are listed in order of prevalence, right) are corn syrup and sugar. I’m eager to hear the response. All infant formulas contain some kind of sugar. Babies need it in order to be able to digest the proteins from cow’s milk or soy. But he doesnt drink either one (cows milk or soy)….and this formula pulls lactose out of it. Maybe I misunderstand, but doesnt milk (regular milk) have natural sugars in it and at the time that he goes to that, a year from now, wont he have adequate access to it? I am just confused on why he is getting it at 5 weeks old.. Unless I’m mistaken, all formulas are synthetic and made from cow’s milk or soy, that’s where the milk proteins come from. Milk (regular) does contain lactose, but getting lactose in a powdered form isn’t always the most digestible. Looks like this is a specialized formula blend for gas reduction… Could the sugar have something to with reducing gas? Maybe, but doesnt sugar make you GO to the restroom? Why would I ever want to give him loose bowels..he isnt constipated, I just needed a lower milk based formula cause he was spitting up, etc when his system was newer. Now I am into this one and hadnt planned on changing him midstream. I am just concerned im loading him up on sugar…it bothers me. I’d heard corn syrup can ferment in the intestines and cause gas and diarrhea. That’s why some people get gas or diarrhea after drinking fruit juice or drinks with corn syrup.